On Sunday, March 24, 2019, about 200 people gathered at Sergels Torg in Stockholm to march for life and say no to abortion. 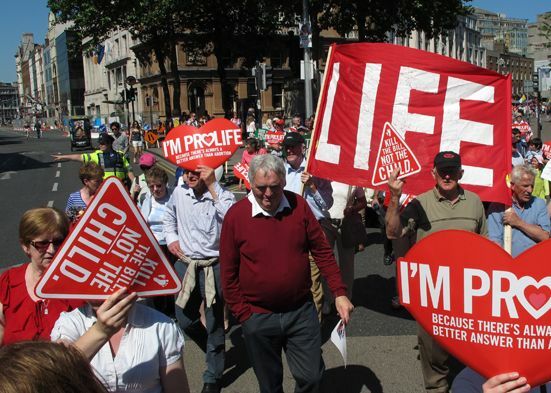 The abortion issue, which has recently found its way back to the spotlight following the State Medical-Ethics Council's report "Life signs after a late abortion", continues to awaken strong emotions and, in this case, demonstrations. Life Choice, started in 2017, works for a Sweden without abortion. On Facebook, Livval's events had been shared around 100 times: "Join us for the unborn child's right to life!" You could read in its description. On Facebook, Instagram and other social media, Sweden's young Catholics urged each other to participate in the march. There were there to give the smallest one voice and celebrate life, with the slogans "Yes to life, no to abortion" echo "For a Sweden without abortion", "Women deserve better than abortion". Men, women and children, families, young people and retirees march from Sergels Torg to Norrmalmstorg singing and waving with flags and signs. On the signs you can read, for example: "Everyone has the right to life", "The right to my body ends where my child's body takes over", "25% of my generation is missing", "Is abortion really always the woman's free choice? ", "Abortion stops a heart beating". Counter-demonstrators gather both the Satanist Society announced a counter-demonstration and also a "Demonstration against the Pro-Life movement in Sweden" were organized however, only 10 counter-demonstrators appeared. Shortened and Edited from Vatican News va - Swedish Ed.